1. I spent 3 1/2 hours at a Beginners Sewing Class last night that was put on by the EFC and led by a wonderful lady. The most I'd done with my sewing machine before last night was sew lines on scrap pieces of fabric just to get used to the machine. With being on a spending freeze I haven't spent any money buying fabrics or other necessary items so haven't been able to actually make anything. I had tried to make my dogs bandanas out of some scrap fabric but ending up making them too small (whooops). BUT at the class last night I was ahead of the field having already known how to thread a bobbin (go me! And also, thanks for teaching me Kels!). We each made a pillowcase and a miniature pillow and they all turned out looking so good and now I want to make all the things! I'm hoping to pick up some fabric this weekend so I can start some more projects that I've pinned on Pinterest. And everyone at the class had so much fun that we decided to make it a once a month thing and I can't wait for the next project! 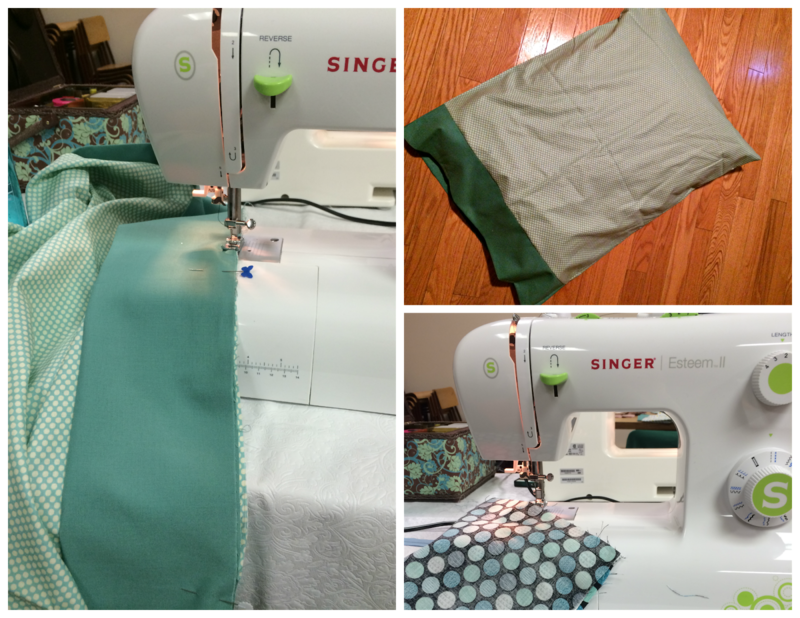 I never would have thought that I'd be joining a 'sewing club' or that I'd actually enjoy sewing! I obviously would have chosen different fabric that matched my comforter if I were making it on my own but we just used whateve was available to make ours. I can't wait to make more! 2. I'm heading out on a mini road trip with my sister after work tonight for a weekend getaway to see our friend Scooby (also crossing something off of my 28 Before 28 list!) in Yorkton. We've been talking about going up there for over a year so this has been a long time coming. When we finally confirmed that we were coming Scooby's response was "You know there's nothing to do here, right?'. Apparently having lived away from O-town in the last 10 years has dulled her memory that there is absolutely nothing to do here. AT ALL. 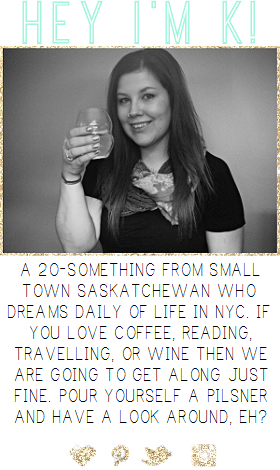 At least Yorkton has restaurant options, shopping options, etc. 3. I FINALLY got my #TenDaysInTexas post up! (Still doing a happy dance over here). I will NEVER wait that long to recap a vacation again. Like, ever. 4. After recapping our Texas trip I started to really, really miss it. I jokingly texted my brother and SIL that we should move the planned Vegas stag/stagette to Texas (we had talked about it while floating the river when we were there) and they are actually in favour of the idea. Hopefully we can iron out some details soon! I'm also still hoping that Toni, Scooby, and I can do Vegas in July for Toni's 'Dirty Thirty'. Some exciting things are in the works and its definitely helping to alleviate my Winter Blues a little bit! 5. I've been really on the ball with replying to blog comments lately and that makes me SO happy! I got so behind in the last few months of 2014 - it was terrible! The best part of blogging is the interaction with other bloggers and I really let that slide in the last part of the year. BUT I have been doing pretty good with posting and replying to comments lately so I'm hoping that setting that tone in January will carry through for the rest of the year. If you haven't received a reply back from me PLEASE check and make sure you aren't a No-Reply blogger - that's no fun! 1. My chocolate brown Ugg boots that I got for Christmas in 2008 and have worn every.single.day of winter since then have almost bit the dust. Theres a huge hole in the one side - like you can see my sock through it. I'm going to stick it out for the rest of this Winter but then I think its time to say goodbye :( Does anyone else get ridiculously sad about things like this?! Please tell me I'm not the only one! 4. I only managed to get about half of my January Goals completed so far and considering tomorrow is the last day of the month and I'm going to be away I'm thinking I won't get them 100% completed. I do plan on getting a few things finished off on my lunch break though and even crossing one thing off is better than nothing! Wahooo to a week of more happies than crappies! I hope everyone has had a great week and has some awesome weekend plans in place!